A group of former refugee kids are gaining future FIFA World Cup skills with their local football teams thanks to a Wellington United Football Club scholarship generously funded by Spark, and supported by Red Cross staff and members. Kaw Guy, front, hangs out with his new squad. When Red Cross Refugee Case Worker, Jonathan San, heard about the scholarships, he put forward names of some of the kids he works with. Jonathan saw the scholarship as an opportunity to “help our boys get into their hobby and interest”. When he let the parents of Htan Ning (pictured below) know that Htan would be playing football this season, Jonathan says they “were over the moon”. With transport to games provided by the Red Cross Open Roads programme, Htan has been getting stuck in with his new team. Htan Ning in his uniform, provided thanks to the Wellington United Football Club Spark scholarship. Htan and his brother, who has also been awarded a scholarship, were gifted a full uniform and boots. Jonathan says, “As soon as they joined the scholarship they were so happy. Every time they come back from the game they will have a chat and take photos. It’s very rewarding and [I’m] very happy to see them feeling that way”. Wellington United currently supports four players with refugee backgrounds and a total of 13 in financial need. The team’s manager and coach are fully behind the scholarship programme and have helped the players feel right at home. 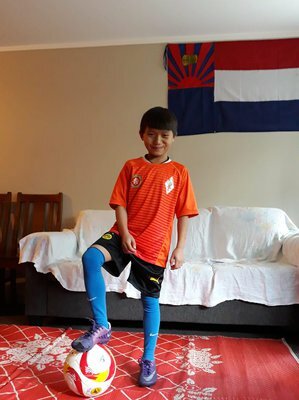 Jonathan and the Ning family expressed their thanks to the Red Cross team in Wellington and Capital Football for helping to connect the kids with their community.